Our Bidi Bidi Scarf comes wrapped in our signature tissue tucked inside a re-usable Obakki Foundation pouch. The package includes information cards explaining how your purchase is transforming lives. 100% of the net proceeds from this stunning scarf will go towards helping women rebuild their lives through the funding of their own business initiatives. Whether in agriculture, textiles or trade, they will be determining their own future. These women are warriors. Wear a symbol of their strength. 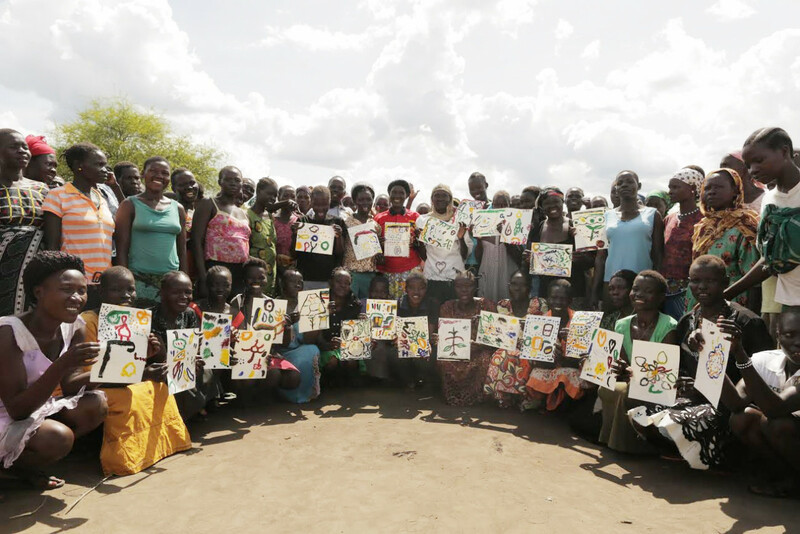 Obakki Founder Treana Peake walked into the large, sweltering tent at Bidi Bidi, the world’s largest refugee camp, with a plan - to help where and how it was most needed. She came to Uganda knowing that these women and children had fled South Sudan in the face of a brutal civil war, escaping violence and famine. But what Treana found was a group of warriors; strong, resilient, remarkable women who were determined to build a new and better future. Working together in the hot tent that sunny morning, they used their hands to create art. And that art became the unique design of the Bidi Bidi scarf. The design of the Bidi Bidi scarf is inspired by the whimsical drawings of women who have been through the unthinkable, revealing a tragic past entwined with a hopeful future. These are depictions of who they are, the trauma they’ve endured and their belief in what is possible. Touching paint for the first time, these brave women used art to express themselves and connect with each other while healing their souls. This scarf represents their past, present and future. It is a declaration of hope and strength. Designed by them, supported by you. 100% of the net proceeds from this symbolic scarf will go toward helping women rebuild their lives through the funding of their own business initiatives. These women will be determining their own futures.